Do you always know how to pray? It can be challenging at times especially when a request can be vague. But as long as we pray the Word then the challenge is conquered. 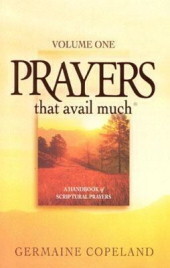 I recently pulled out my copy of Prayers That Avail Much by Germaine Copeland. I have some prayers that I've been praying over someone and wanted to add one from this book. If you're still pondering my question then please get this book! It has some terrific prayers, all scripture based and is a perfect place to start! And I'm a firm believer that God hears even the smallest prayer....so just do what you know how till you've learned more!